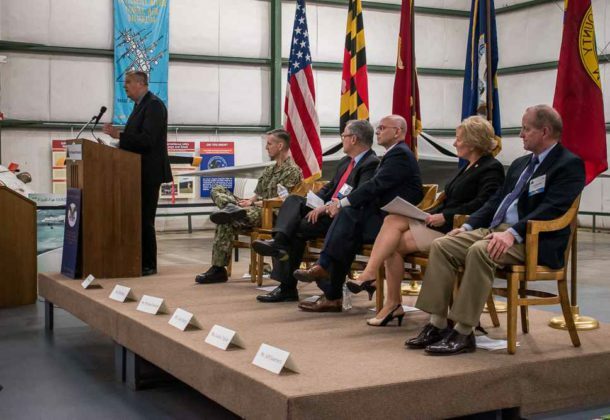 VADM Peters delivered introductory remarks to a panel on the imperative to accelerate acquisition and develop ready-to-deploy systems, at a program by The Patuxent Partnership (TPP) and the Association for Naval Aviation Squadron #18. The tone of the panel discussion echoed a recent TPP program on small business contracting by Emily Harman, director of the Navy Office of Small Business Programs, and reiterated the urgency for industry and defense to reduce the time it takes to get the right tools to the warfighter. Ms. Harman’s message was that there are routes readily available to speed up the acquisition process for any small business with a product or process that can deliver what the warfighter needs. The TPP-ANA briefing focused on what the Navy is doing to continue to accelerate. “I corral and commission you all to be partners in this transformation,” VADM Peters said as he introduced Bill Bray (SES), deputy assistant secretary of the Navy for research, development, test, and evaluation, who served as the keynote speaker and panel moderator. Mr. Bray described ways the Navy is increasing speed in acquisition, such as decentralizing decision making, pushing authority and responsibility downward, and putting multiple tools into the hands of decision makers. Some are ready to use, but not everyone is aware of the full array of options. The push now, is to get the memos and policies out at the right levels so these new tools and accelerated methods can be used. “Now it’s up to the community to use them, and then institutionalize them,” said Mr. Bray. Communicating successes laterally has become a priority. If rapid transfer of a need into the warfighter’s hand worked in one area, it could work in others as well. In the area of research and development, Mr. Bray described additional ways the Navy is “moving things through the system more rapidly.” Congressionally mandated funding for more science and technology labs at warfare centers accelerates discoveries and further supports lateral communications. “I do see movement in the right direction in how we do business,” Mr. Bray said. Mr. Stewart’s commitment to cutting unnecessary steps has him starting at the very beginning and following the process forward. The imperative to slash the time from idea to deployment also drives Gary Kurtz (SES), assistant commander for acquisition for NAVAIR’s program management competency. Efforts to accelerate are making strides, however. Mr. Kurtz gave examples of three significant combat safety issues that are nearly or already resolved: a “Fitbit” type of device for pilots that detects and provides advance warning for hypoxia, the upgrade of the F-35 cockpit, and replacement of the MH-60 gunner seat. “Quit wasting time and speed up what’s right,” said Leslie Taylor (SES), NAVAIR deputy assistant commander for test and evaluation and NAWCAD executive director, quoting Dr. Michael Griffin, undersecretary of defense for research and engineering, and James “Hondo” Geurts, assistant secretary of the Navy for research, development and acquisition. “It is absolutely about speed at a warfare center,” she said, and praised the warfare center laboratories for their efforts. Each warfare center is investing two percent in its workforce and to revitalize its laboratories, she said. The collaborative spaces are making prototypes and developing solutions. According to Ms. Taylor, these are spaces for work in virtual reality, augmented reality, robotics, corrosion preventions, and batteries, to name a few. Ms. Taylor credited the benefit of in-house researchers, engineers, and technicians for an extraordinarily accelerated program, which she oversees and was mentioned by several panelists. Among multiple initiatives, she also mentioned one ongoing consideration, offering “cash prizes for outcomes” to program executive offices and program management activities. The time for delivery to the fleet has been cut to less than five years, she said of the accelerating demand for speed. The goal is to reduce that further to 18 to 24 months – or less – she said. As for what it means to go faster for contracts, “Procurement is where we need to reduce,” said Jeff Guarnero, deputy department head for NAVAIR’s contracts department. Mr. Guarnero described the success of Ms. Taylor’s accelerated project as the result of a “dedicated team with 100 percent attention on that procurement action.” Concurrent workloads, he emphasized, slow the procurement process. A fully dedicated acquisition cell can work very rapidly, he said. He also pitched an idea of a single, electronically disseminated strategic source plan, within security restrictions, that makes clear what the Navy needs. He encouraged contractors to attend NAWCAD Industry Days throughout the year. These events, Mr. Guarnero said, convey the Navy’s immediate needs to industry and can explain acquisition routes available to contractors able to make delivery on those requirements. “Do we know how fast is fast enough?” asked an audience member.